Blytheville Primary School first-graders from Bridget Jones’ classroom who so far have donated the most coins for “Coins for a Cause” include (left photo, from left) Degrick Evans, Warren Moriarty and Johnny Partee, Jr.
Blytheville Primary School’s first-quarter community involvement project, “Coins for a Cause”, is off to a good start primarily because the organization that will benefit from the project is so worthwhile. Melissa Moriarty contends, however, that she expects even more success from the students because they know the community will continue to support them. 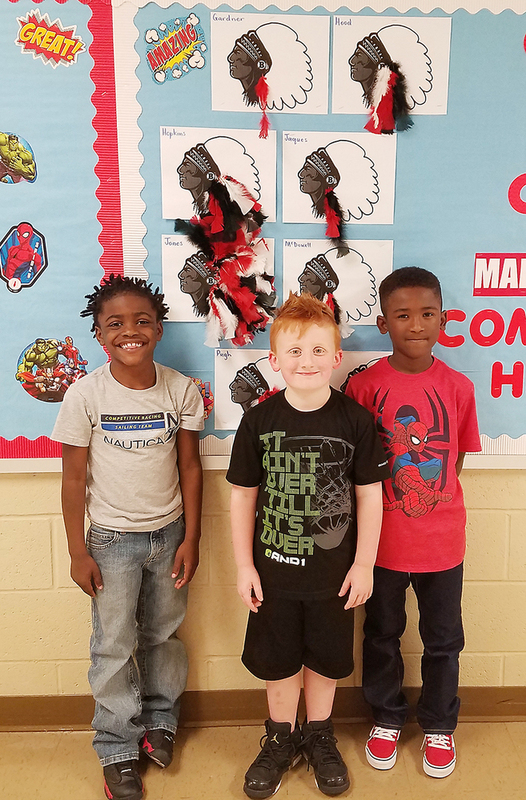 Moriarty, speech therapist at BPS, and reading interventionist Tracy Plunkett are helping the kindergartners, first and second-graders collect money that will be given to the Blytheville Public Library, which needs funding to remain open. The projects are part of the school’s Strategic Plan. “Our plan is created every year to increase student achievement and growth. Community Involvement provides them the opportunity to participate in projects which give back to the community that continues to give so much to us,” she stated. “Coins for a Cause” is pretty simple. The students are asked to collect money for the public library. They can collect the money (coins) any way possible, from retrieving money that may be found in their furniture, giving money they may have saved for a while, to even asking their parents for donations. The money is being collected at school through Oct. 12. Meanwhile, Moriarty and Plunkett challenged “Me and My Sister” owners Lori Hixson and Leslie Wells to match the children’s total donation up to $200 for “Coins”, which Hixson and Wells accepted. They then challenged another business, Dr. Tommy Westbrook’s dentist practice, which went on to challenge Kenny Thomas, of Thomas, Speight, and Noble, to raise money, creating a chain of businesses that would support the library and, hence, the students. BPS’ Strategic Plan includes four parts: Community involvement, attendance, instruction and behavior. Moriarty said that the Arkansas Department of Education mandates a 97-percent attendance rate, and that last year BPS’ attendance was at 95 percent. She said students are considered “chronically absent” if they miss two or more days per school month or more than 18 days out of the year. The school has begun an “attendance group” aimed specifically at helping those students get to school every day. BPS school records on Sept. 5 indicated a 96.3 attendance percentage. Teachers and instruction team members Jennifer Bennett, Suzanne McDowell and Lesha Foster have been examining iStation data to find areas in which more classroom instruction is needed. Moriarty stated that the Reading Initiative for Student Excellence Arkansas encourages a culture of reading by coordinating a statewide reading campaign with community partners, parents and teachers to establish the importance of reading in homes, schools and communities. BPS leaders are also tracking students during their years at the school, with their intention that 70 percent of all students read at grade level by the time they complete the second grade. As for student behavior, school officials want a decrease in office referrals. BPS recorded 11 referrals from the beginning of the school year through Sept. 5, including none for the entire first grade. Moriarty said that the Positive Behavior Interventions and Support program, with a list of “Expectations” for each area (for example, classroom, recess, lunch room and restroom) have been significant helps. Moriarty went on to say that BPS has helped in a number of ways with community involvement. “Last year we adopted the Humane Society, the Police Department, Fire Department and Health Department. We want our students to know that they can make a difference. It will help grow their self-worth and, in turn, help them become more confident students,” she said. “Even if a student finds a penny on the playground and gives it for another organization, that student knows he or she is making a difference. Kindness is never too small to be shared”. With “Coins for a Cause” the hope is, she added, at least one business each week through Oct. 12 will be able to assist in helping the public library remain open. Moriarty said the Primary School is also planning to adopt the Mississippi County Union Mission, the Haven and the Blytheville Food Pantry with future community involvement projects.